Finally we got confirmation from leaked document via wikileaks that Sony will soon going to announce new Sony A7R II camera, A7000 and new compact RX series camera (possibly RX100 M4). 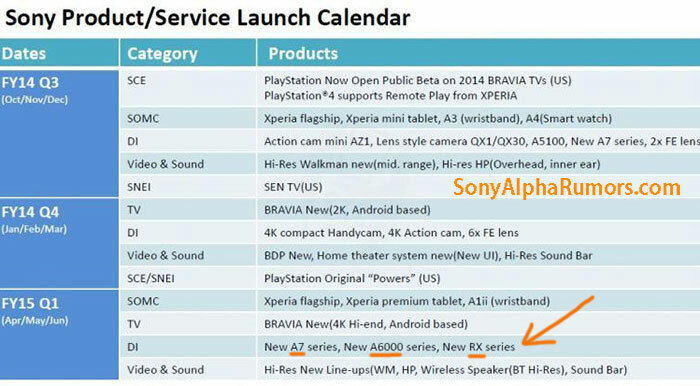 The image above you see is official Sony Product launch Calendar til June 2015, that clearly means that all the three camera coming before June 2015. On April 23, 2015 the Sony will going to announce RX series compact camera and on Mid May 2015 Sony is expected to announce the A6000 successor and A7R II camera. tay with us FACEBOOK | TWITTER | GOOGLE+) and we will update you soon as we get any Sony Rumor. Sony A7 III and RX100M V Coming in June 2016 ? Great informative web site. Thanks! A couple of things for your consideration: update your recommended section every quarter given the new models being currently released; and, proof-read the text with announcements. I notice many grammatical and spelling errors. Perhaps that’s just a limitation of the translation software being used.